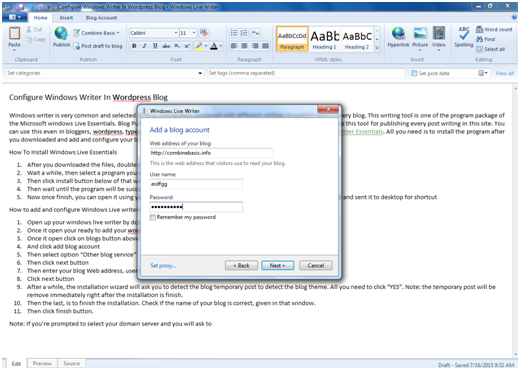 Windows writer is very common and selected as blog writing tools equipped with different utilities to publish post in every blog. This writing tool is one of the program package of the Microsoft windows Live Essentials. Blog Publishers use this tool came from the Microsoft company. Even this site use this tool for publishing every post writing in this site. You can use this even in bloggers, wordpress, typepad, and more. You can download right here in this link: Windows Live Writer Essentials. 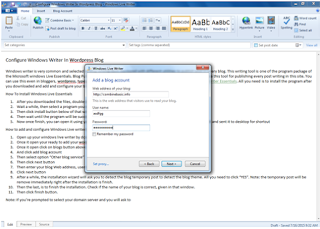 All you need is to install the program after you downloaded and add and configure your blog sites for the connectivity of this writing tool. Wait a while, then select a program you want to install only, uncheck the program you don’t need. Then click install button below of that window. Then wait until the program will be successfully install in your computer. Open up your windows live writer by double clicking the icon in the desktop. Once it open your ready to add your wordpress blog and even the blogspot. Then enter your blog Web address, user name, and password. After a while, the installation wizard will ask you to detect the blog temporary post to detect the blog theme. All you need to click “YES”. Note: the temporary post will be remove immediately right after the installation is finish. Then the last, is to finish the installation. Check if the name of your blog is correct, given in that window. I'm a husband, a blogger and Biomedical Machines Specialist, also a computer instructor and technician and a crazy writer, I like to write and build blogs and avid fan of social media. I have built this blog just to help others through information. Follow us on Facebook and Twitter.